Why are classes, seemingly, never the priority for developers? Considering your class or character is what your entire game experience revolves around it always amazes me when so little time seems to be spent on improving, fixing and balancing them. Instead, what I’ve certainly found over the past 15 years is that classes are well and truly last with the focus always on developing new content. You might think that it’s a sensible design decision to develop new content and bug fix existing but I’d state that the opposite needs to happen in order to retain players. Typically within the genre developers are of the opinion that they need to provide players with more, more, more in order to keep them playing. From my experience the thing that keeps players playing is their investment in their character and not necessarily the constant need for new things to do. And yet despite all that and having played well over 1,000 hours of WildStar across Beta and Live, I’ve not even scratched the surface of completing everything. Why then have Carbine chosen to deliver the Strain Ultra-drop so soon after launch? I’m not in any way complaining about the content itself because it’s most welcome: the new zone is gorgeous and the world event is excellent. But I think it's fair to say it just isn’t needed at this time when class balance and bugs are so rife and hindering the primary enjoyment of the player base. Take something as minor as the AMP system. You gain points to spend in AMPs as you level and once you’ve spent those points you need to spend money to re-specialise. During the early levels the cost of re-specialising your AMP points is low (a few gold) but at level 50 it costs 50 gold. For the vast majority of players this isn’t a small sum of money and when the AMPs you hope work, don’t, it’s incredibly frustrating. I spent over 3 Platinum in around 45 minutes testing AMPs that I wanted, only to find they were bugged or didn’t work as written. The same can be said for a variety of skills and ability tiers that function terribly, serve no purpose or don’t work as intended. 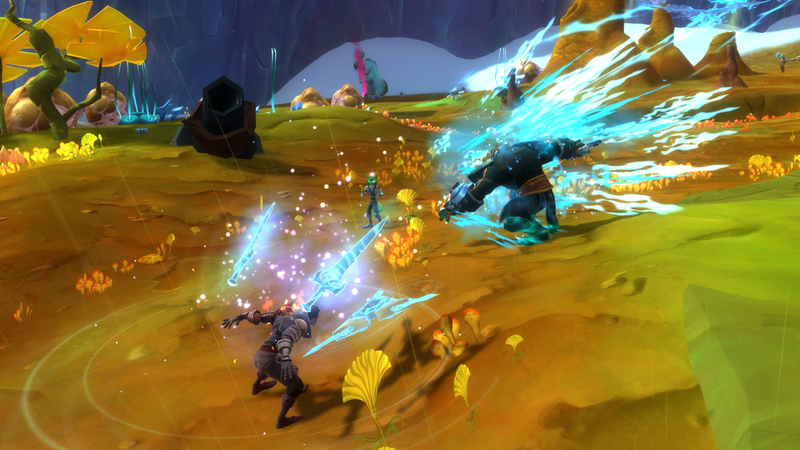 Addressing these issues is surely a greater priority over adding additional land-mass when the land-mass in WildStar already offers a wealth of things to do. If your class doesn’t function as intended, is unbalanced or is causing your play time to be miserable because of a myriad of bugs, it doesn’t matter what extra you’re given because it’ll be overshadowed by the fundamental fact your class is crippled. I fully understand that there are multiple development teams of varying sizes with varying priorities but I’m always amazed at how little action there is at squashing bugs and fixing classes. Considering WildStar has class leads (just like every other massively multiplayer game) I can’t fathom why so little is done when it comes to cleaning up the classes. I’m sure they have other roles and responsibilities and assist on a variety of content but watering down their role in this manner only further undermines cleaning up the classes. Class leads need to be much more active in the community, provide a roadmap of what the bugs and priorities are while pushing for large swathes of fixes every single month. The recent Public Test Realm patch notes for July’s update show so little fixes (though Carbine admit half are missing) that I actually face palmed this morning. Long standing issues from closed Beta are still here and new ones crop up after every patch. Without taking the bull by the horns and dealing with them now, class problems are only going to snowball to the point where an already annoyed player base call time on their subscription. No amount of new content is going to adjust that mindset unless they see action taken for their class. In Carbines defence, massively multiplayer gamers are a hard bunch to please. They want their class to be fixed yesterday and they want every other class nerfing. While I sympathise, it’s fair to say that there has been plenty of time even post-launch to make inroads into fixing many class issues. Instead it well and truly feels as though because classes are functional that players will manage fine in the mean time. I’m not sure I and other players are willing to settle for that any more.